The local Memphis priority is corporate / real estate development; not economic development for all. One can just watch local proceedings, to draw the above conclusion, that approves a $100M Union Row project with blistering speed, while seemingly bulldozing through a mayoral request for additional review time citing approval delay could threaten the project. And then just as the first $100M traunch is approved, the Downtown Memphis Commission (DMC) comes right back to ask for a $50M loan for parking that, yet again, threatens the Union Row project without expeditious approval. Meanwhile, entire segments of the Memphis population are dismissed without a coherent economic development plan after almost a year, disconnected workforce development efforts persist as workforce development is touted as the #1 priority, public transit is sidelined and small business vitality plummets. And the local press, without differentiation, enables the corporate pig feeding frenzy while generating siloed reporting without connecting the dots for the public. Connecting the dots would reveal corporate pigs feeding off taxpayers as entire segments of the population are systematically dismissed. Without a plan from the Greater Memphis Chamber, economic development reform has stalled as corporate/real estate development speeds ahead. It must be stated that, in the summer, Memphis Raise Your Expectations (MRYE), advocated for specific solutions that included adopting a researched based definition for economic development, a method of measuring economic development progress and adopting the Amazon Road Map economic development policy pronouncement of the University of Memphis as a framework for an economic development plan. But that proposal was dismissed by the corporate elitist establishment in favor of what exists now; no economic development plan. The Shelby County Commission further passed a resolution, without a time table, to review 9 abating boards besides the Economic Development Growth Engine (EDGE) which has garnered most of the local attention. While reviewing 9 tax abating boards is desperately needed, the effort will go nowhere with an enabling non-differentiating establishment press reporting in siloes and without paid representation for the taxpayer. The Memphis taxpayer has no voice as the establishment press proceeds without needed inquiry, all while covering only representatives of the Memphis Tomorrow informal network. Informal networks were documented as a concern in the diversity report. Memphis Tomorrow informal network members such as EDGE and the DMC dominate economic development legislative schedules while taxpayers are left without paid representation and an establishment Memphis Tomorrow press that reports the “economic opportunity for all” and “momentum” rhetorical bullet points of the informal network. Legislators hear only one presented side and that of the paid Memphis Tomorrow informal network. 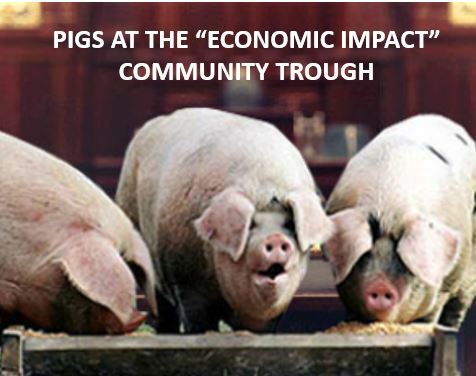 It’s a network that has spearheaded persistent community decline, working largely unchecked, as the corporate/real estate elitist pigs have devoured true economic development through excessive tax incentives at an estimated taxpayer cost of $124M recurring per year. At a community meeting, led by Dr. Earle J. Fisher at Abyssinian Baptist Church with The Daily Memphian represented by Eric Barnes (whose voluntary on the ground community presence was not required but appreciated), concerns over nuance, slant and non-differentiation were voiced by participants away from establishment reporting that could otherwise give the taxpayer at least some voice. But that is unlikely to change with The Daily Memphian, who has an anonymous establishment donor base. Hopefully, some press outlet will pick up the slack in a more investigative press as it relates to questioning the Memphis Tomorrow informal network. As far as EDGE reform, nothing has occurred. This is especially concerning after a majority of EDGE Board members have served seven years while employing incomplete and bogus retention PILOT accounting to justify excessive corporate/real estate PILOTs. In the summer, as a proposed solution, MRYE advocated for a new EDGE Board with professional balance from small business, education, transit and the corporate sector to drive balanced economic development reform but still nothing has evolved to reform EDGE. Legislators and the local press, in reference to the highly ineffective Memphis Tomorrow informal network, have been reluctant to even broach the topic of new faces on the EDGE Board. In the meantime, except for the favorable Indigo PILOT (with the specifics of the DMC parking incentive still outstanding), EDGE unfavorably roars ahead, unquestioned by the establishment press, while approving real estate deals labeled as economic development. In a stunning EDGE Board action in November, the Board approved an expansion job PILOT for 30 warehouse jobs for Mark Anthony, Inc that abated $2M in existing property taxes at a $500K loss to the taxpayer while EDGE pocketed $51K in fees. EDGE is clearly incented to conduct transactions as opposed to representing the needs of taxpayer. This reality helps explain the drivers behind the corporate welfare culture of the Memphis Tomorrow informal network as the the $500K taxpayer loss and corresponding $51K in fees to EDGE went unreported by the establishment press. 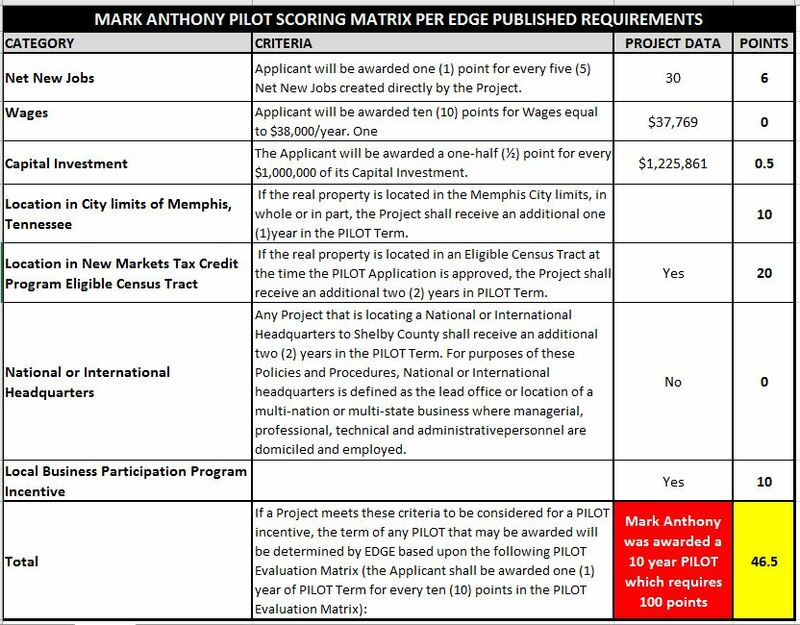 Curiously omitted from page 2 of the Mark Anthony Project Summary was the customary page 2 of EDGE project summaries entitled “Tax Incentive Eligibility Analysis”. Upon investigation, which doesn’t occur by the local press or legislative bodies, an external “Tax Incentive Eligibility Analysis” was conducted using EDGE requirements. The analysis reveals that the EDGE Board did not follow their own requirements when granting a PILOT award of 10 years to Mark Anthony, Inc. A 10 year PILOT would have required a score of 100 according to EDGE requirements. The external analysis resulted in a score of 46.5 far off the 100 required score for a 10-year PILOT. See the below analysis. This occurrence is unfortunate in that if for some reason the EDGE Board wants to continue incenting warehouse jobs, they could have somehow accommodated the taxpayer while honoring their published guidelines by 1) reducing the tax incentive by 53..5% over 10 years or 2) reducing the PILOT term TO 4.5 years. Had the EDGE Board followed their own guidelines the incentive would have been reduced by $1.2M from $2.3M saving taxpayers 1.2M. But the EDGE Board chose neither and to not follow their own policy requirements. This is just another in a series of actions that points to the need for a new EDGE Board. And besides, EDGE recommended reform efforts have been delegated to the EDGE Board itself by local legislators which means reform efforts won’t work because the EDGE Board will likely not follow their own guidelines. So, a new EDGE Board is needed as recommended in the summer by MRYE. The taxpayer, in a community left behind, has been systematically dismissed by the deficient Memphis Tomorrow informal network of corporate elitist pigs. It’s a culture, rooted in a rigged Crump culture of years gone by, enabled by conforming legislative bodies and an establishment press that leaves the citizenry further behind in a knowledge based global economy. Going forward, paid taxpayer representation is needed to give the taxpayer voice and to provide needed balance for legislative bodies in considering taxpayer funded economic development efforts. This is best for all and that includes the Memphis Tomorrow informal network.